A bad start to the day: the builders (who are doing something that seems to have had no archaeological monitoring at St Nicholas’s School) had blocked the car park, forcing most of us to park in Church Lane. Having told us just before ten that the car park was clear, it turned out that they had parked so haphazardly that it was impossible to park more than a couple of cars in there. So the residents started complaining. Tough on them: complain to the builders, who are preventing us from using the car park that enables us not to park in the lane. Its still very dry on site, but we are making progress. Deposit (7)/(8) should be gone by lunchtime and I’m hoping that well be able to make a start on the underlying material. It’s our open evening on site, so Mick and Chris have gone to collect that tables we’ve been lent. We’ve got big banners from NHDC and the Letchworth Garden City Heritage Foundation as well as from the National Lottery (which has been up throughout the excavation) and Hertfordshire Timber. There is a marquee which is going to be erected between the site and the churchyard gate, which is where the display that Phil and Sam Thomas have prepared will be put up. I suspect that it’s also where refreshments will be served and finds shown to the public. The weather really feels autumnal now. It’s overcast, cool and occasionally breezy. Summer barely seems to have happened for the second year running. I think I’ve needed sunblock on only three occasions on site! I’m really hoping that we find some definite traces of a building before the end of the excavation. The material beneath (7)/(8) at the north-western end of the trench, context (18), looks to contain a reasonable proportion of tile, as has (7)/(8) itself, so we must be close to the site of a building. Given the type of tile, which does not appear to me to be medieval, I’m hoping that we’re close to it stratigraphically. There is still a very definite platform on the site, which the archaeological deposits appear to be following, for the most part. Chris has had a look at (18) and its relationship with (14). It’s evidently overlying it, with (14) dropping away to the north-west, at least in the trench extension. At least with these deposits that can be distinguished by their different degrees of stoniness, we can see tell them apart even when conditions are as dry as they are currently. Mick is planning (18) as a prelude to excavating it. It’s a relatively simple plan, so it ought not to take too long before people can get to work on it. I’ll be interested to see the date of material from it (all that’s visible at the moment is early modern-looking tile). By 2.35, it was ready to excavate. I’m beginning to wonder if (14) is the remains of an external surface. It does have a rather cobbled appearance, with its western edge aligned roughly on the top of the platform. It would be good if (18) turns out to seal the foundations of the last building on the site! At some point this afternoon, several people are going to have to put the marquee up. I’m not sure when Phil and Sam are bringing the display materials across or quite how they are going to be mounted for this evening, though I’m sure that Mick and Chris have it all sorted out. A deposit that looks very like (and probably is) (14) is turning up underneath the northern part of the north-western end of (18). If this is the case, then (14) could well cover the entire trench outside the hollow way. Based on its characteristics where Philip is working, it’s likely to turn out to be very difficult to excavate. The degree of compaction is not consistent throughout, but so much of it is highly compacted that it is very likely to have been laid as a formal surface (or at least, as the foundations for a surface). Towards the end of the day, Phil found an iron buckle in the deposit. A couple of minutes earlier, George had found a copper alloy lace tie (if that’s the correct term) in (7)/(8). 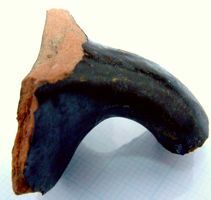 Nothing emerging from (18) so far seems to be later in date than 1600 and most of the pottery has been medieval (although there is a sherd of possible Tudor Green ware). 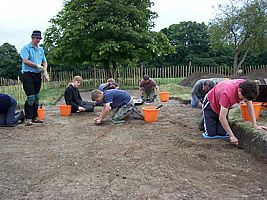 Posted on 29 August 2008, in Fieldwork, Norton Church Field Dig 2008. Bookmark the permalink. Leave a comment.